Cutrone Barbershops has been serving Chicago’s Southside neighborhoods with mens hair cuts and hot lather straight razor shaves, since 1973. Over the years, Cutrone's has become one of the Southside of Chicago's original premier barbershops. Generations of grandfathers, fathers and sons have developed this popular hotspot, standing strong for over 40 years. We value our customers as a top priority, and make it our responsibility to meet each individual needs. Cutrone's barbershop offers both a style and community experience as a true "neighborhood shop." Our social setting provides our customers with an opportunity to relax and enjoy their surroundings while experiencing the highest level of service. Stop by our shop at 3118 West 111th street for your next cut and shave, or to checkout our exclusive selection of men’s barber products. We are proud to stock Uppercut Deluxe, Layrite Pomade and Proraso shaving products. *WE TAKE LAST CUSTOMER 15 MINUTES BEFORE CLOSE. WE HAVE A TRUE PASSION FOR BARBERING. Our barbers combine modern men’s hair cutting techniques with timeless traditional barber services. 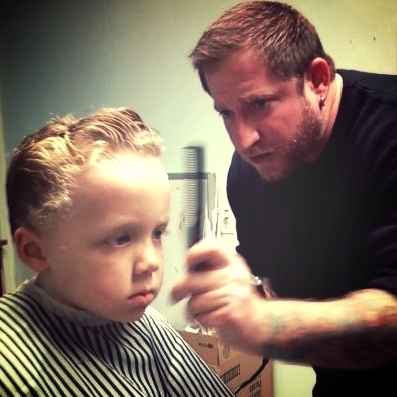 Our team of dedicated and passionate barbers have spent years training in the industry honing their skills and talent. So whether you’re looking for a classic cut, a sleek modern style, or a straight razor shave each barber is simply focused on making you look and feel your absolute best. © 2015 ALL IMAGES AND CONTENT ARE PROPERTY OF CUTRONE BARBERSHOP.